A Congressional "Gun Violence Prevention Task Force" report admits that no link has been found between games and gun violence but calls for more research to be done. 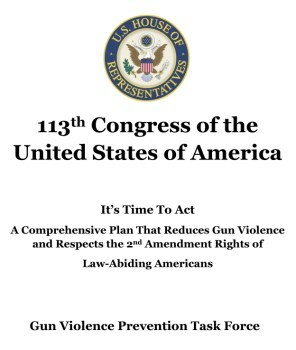 "The Comprehensive Plan That Reduces Gun Violence and Respects the Second Amendment Rights of Law-Abiding Americans" is the result of a congressional inquiry launched in January that has "met with people on both sides of the aisle and all sides of the issue" to come up with strategies to reduce gun violence and make the nation safer while still respecting the right of the people to pack heat. The inquiry was sparked by the December 14 mass murder at the Sandy Hook Elementary School, which left 20 young children and six adults dead. Amazingly, as the report notes, in the seven weeks since that mass murder, "more than 1480 Americans have been killed by gunfire." "The need for action cannot be overstated. Gun violence is a public health crisis of epidemic proportions," the report adds. "In one year, an average of over 100,000 Americans are shot. 32,000 of these individuals die. Nearly 12,000 of these are murdered, which is more than 32 Americans every day, and another 19,000 of these commit suicide using a gun." The report makes a point of recognizing the Second Amendment right to bear arms, although it also notes that this right is not without limits. In that light, while it expresses support for the right to "possess firearms for hunting, shooting sports, defense and other lawful and legitimate purposes," it also recommends the reinstatement of a federal ban on assault weapons and magazines that hold more than ten rounds, a requirement for background checks for gun sales (with reasonable exceptions), a crackdown on illegal gun sales and improvements to the mental health care system to ensure that it is accessible to anyone who needs it. It also, unsurprisingly, touches on the impact of media on violent behavior. "While recent scientific research has not demonstrated a causal relationship between modes of entertainment and violence, more research should be done, including with the backing of uninterested government scientists and experts," it says. "We support making available more information about content choices to our parents and communities, and urge that further scientific research be conducted on possible relationships between the depiction of violence in entertainment media and gun violence in our communities." "The entertainment and videogame industries have a responsibility to give parents the tools to make appropriate choices about what their children watch and play. It is clear to us that these industries take this responsibility seriously," it continues. "However, as new technologies emerge and new entertainment platforms are developed, Congress must continue to work with these industries to ensure that their efforts remain successful." It's a reasonably even-handed approach to an incredibly difficult problem, but the Comic Book Legal Defense Fund says the call for more research into the relationship between media and gun violence is "of concern" because it flies in the face of 25 years of research that has found no such links. It also notes the implication that the current "elective" videogame rating system is inadequate, despite repeated findings by the FTC that the ESRB rating system is more effectively enforced than those of any other entertainment medium on the market. The "Comprehensive Plan That Reduces Gun Violence and Respects the Second Amendment Rights of Law-Abiding Americans" can be read in full at the Comic Book Legal Defense Fund.